After a busy past year, Mountain Justice is rebranding. They’ve joined Sunrise, a national “movement to stop climate change and create millions of jobs in the process,” according to their website. “Last year I remember hearing about Mountain Justice just about every week,” said Matt Palmer ’18, who has not been part of environmental groups at Swarthmore. From a campus-wide panel about divestment to a sit-in in President Smith’s office, the climate justice organization was incredibly visible last year. This year, they’re trying something different, but they hope their impact on campus will be even greater. Sunrise was launched this past June by a group of 12 people, including four Swarthmore Mountain Justice alumni. The founders come from different sects of the climate justice movement, including the environmental organization 350.org and anti-pipeline groups as well as pro-divestment activists. With these varied backgrounds, Sunrise aims to mobilize Americans concerned about climate change and pressure elected officials into action. Swarthmore’s “hub,” or chapter, will remain focused on Mountain Justice’s original mission of getting organizations to divest from fossil fuels while pursuing these broader goals. Nationally, Sunrise has already made a splash, particularly at one of their #ShineALight events in August. September Porras ’18 crowdfunded her way into a fundraiser to confront Marco Rubio on his donations from the fossil fuel industry. At the event, Porras couldn’t speak to Rubio directly, so she called out in the room. “Senator, if you really care about young Americans,” she said, “why did you take three-quarters of a million dollars from fossil fuel executives in your last Senate election?” PolitiFact Florida rated Porras’ claim half-true because the number she cited included funds from Rubio’s 2016 presidential run as well. According to PolitiFact Florida, Rubio avoided the question. He said he was glad he lived “in America where she can say that,” as opposed to some other countries where she could “go to jail. He then called for the U.S. to achieve energy independence. “It was our kickoff event for Sunrise across the nation,” Porras said. The event was videotaped and is available online. Although Sunrise’s other actions probably won’t be as dramatic as Porras’ confrontation of Rubio, Porras said her actions were in keeping with the group’s goal of putting pressure on elected officials. “The point is less to make our elected officials suddenly change their minds about climate change … [and] more to show people how corrupt they are,” said Porras. To work toward this goal and mobilize young people, Sunrise has planned a full calendar of events both nationwide and here at Swarthmore. This Tuesday they had a watch party in Roberts with a livestream from national Sunrise leaders. Over the course of the semester, they plan on talking to community members about what they love and have to lose from climate change, gathering objects that represent individuals’ concerns. They aim to put these objects in a time capsule and take them to Harrisburg, Pa., when they march on the state capitol in November. That month, they’ll also be marching in Philadelphia and Pittsburgh with other Sunrise hubs, protesting President Trump and Secretary of State Rex Tillerson’s representation of the U.S. at the Climate Change Conference in Bonn, Germany. Although they’ll be protesting global events, Swarthmore’s Sunrise hub will still be focused locally. 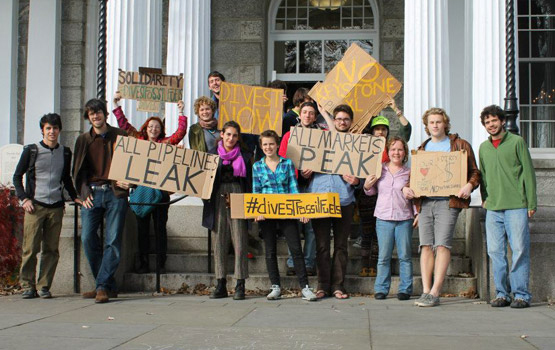 There are many other environmental groups working on campus, and sustainability and environmental awareness are stated goals of the administration. “Institutionally, Swarthmore College recognizes the importance of addressing climate change, using natural resources in a sustainable manner, and educating its community to be responsible stewards of the environment,” says Swarthmore’s Sustainability website. In an email, Sustainability Director Aurora Winslade affirmed the administration’s support of students working to fight climate change, and that the Office of Sustainability has opened a dialogue with Sunrise. Like Winslade, Matthew Palmer ’18 is unfamiliar with Sunrise, but he thinks it shows promise. Despite their broader focus, Sunrise will continue Mountain Justice’s effort to pressure the administration to divest. They will remain focused on holding the administration accountable along with the rest of the Swarthmore community, arguing for change not only in rhetoric but in action.